A few weeks ago I received a package with seasoning from Ariosto. The intriguing aroma of herbs perfumed my kitchen before I opened the package. I loved it from the first smell. Then I tasted each of all five seasonings: for roasted and fried potatoes; for roasted meats/grilled chicken; for tomato sauces; for oven cooked or BBQ Fish; and Garlic and dry chili. Such ingredients as rosemary, juniper, basil, marjoram, parsley, coriander, laurel (bay leaf), sage set me in my cooking mode. I had some fresh tomatoes and was eager to try the first seasoning (for tomato sauces). Cut tomatoes in half, place in a baking dish with 3 tbsp olive oil and sliced garlic. 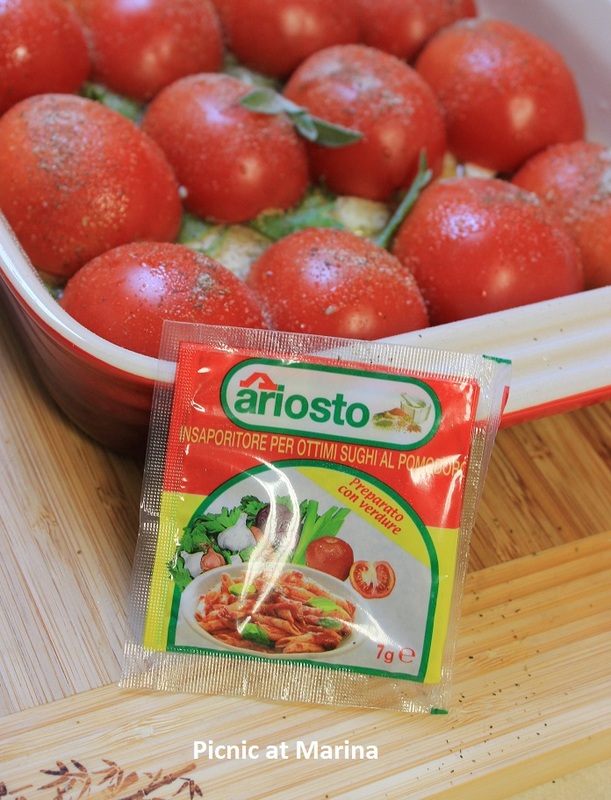 Sprinkle tomatoes with Ariosto seasoning and drizzle with remaining olive. 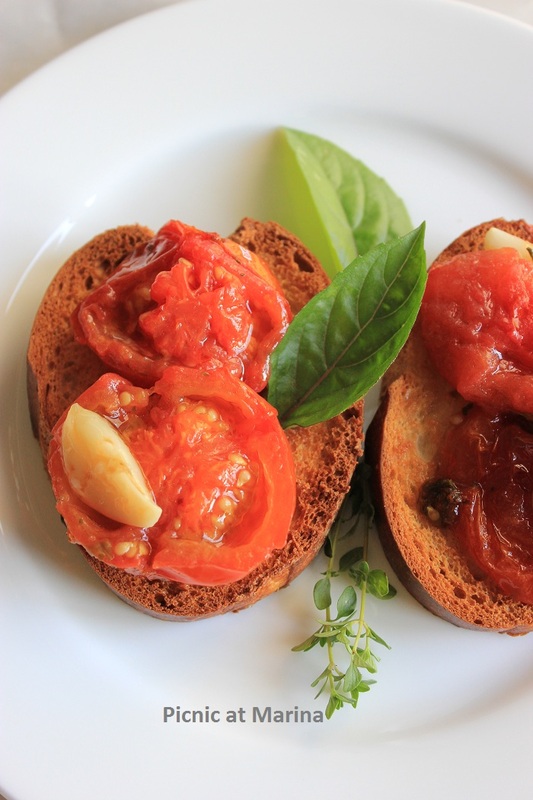 Serve on a toast with fresh basil to enjoy the flavor. The Ariosto seasoning has my five stars, this is a keeper. Herbs and salt are balanced well without overpowering each other. I used the seasoning in another dishes, and also made a salad dressing with it. Because this seasoning has both salt and herbs, sodium content in food is lower, but the taste is reach and flavorful. *I received a free samples to review from the Ariosto. All thoughts and opinions stated in this post are 100% mine. Roast tomatoes are great! I've not heard of Ariosto seasonings - sound like they are a winner. I'll have to look for them. Thanks for the heads up! You are most welcome! Roasted tomatoes are great, I've been using it in many dishes and everything comes out delicious. This is pretty much my perfect lunch! Like your rosted tomatoes. I too never heard of Ariosto seasonings, did you check out the list of ingredients? Your pictures are getting best from better. There are few things I enjoy more than roasted tomatoes. I have to admit I am not a tomato fan so I've never tried this. But my hubby is so I want to try this out. He'd love it. Your photos are gorgeous. That second shot is just wonderful. Kim, if he likes tomatoes, he would love this for sure. Today my husband asked me where is that tasty sauce he puts on everything... I make it every other day, and it's better when it cools down. :)Hope you make it for your hubby! If I see some of this seasonning I'll remember from you that is good! Your tomatoes looks really good! Thanks Kim, yes, I like this seasoning as a go to option, it has a balanced herb combination. When I see a clove of garlic on top...I know I will love it! Great recipe! Thanks! I love a good roasted tomato. It just makes me happy and this dish makes me really happy! 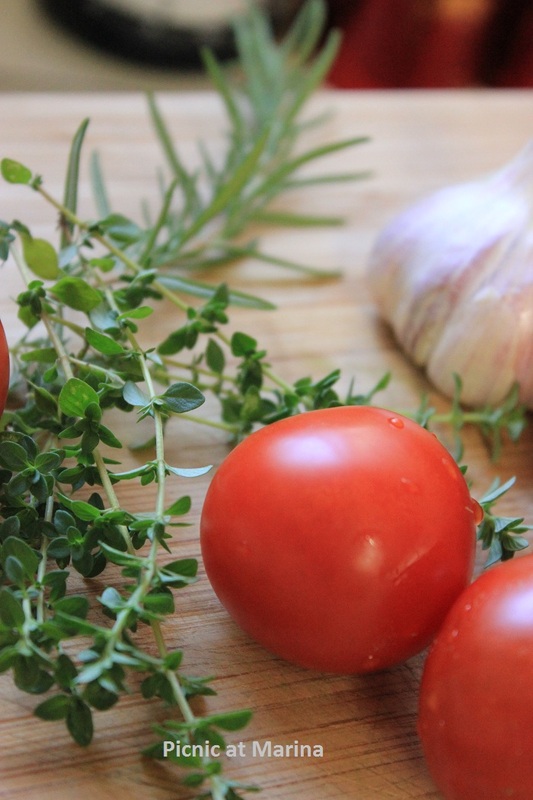 Your roasted tomatoes are gorgeous, such beautiful tomatoes, and a wonderful herb seasoning. Your photos have gotten gigantic...really great photos, but I would reduce the size a "tad bit!" When I start harvesting my heirloom tomatoes, I must try this. Great photos especially the second. It looks like I can touch the screen and pick up the tomato. Such beautiful photos and your tomatoes sound delish! 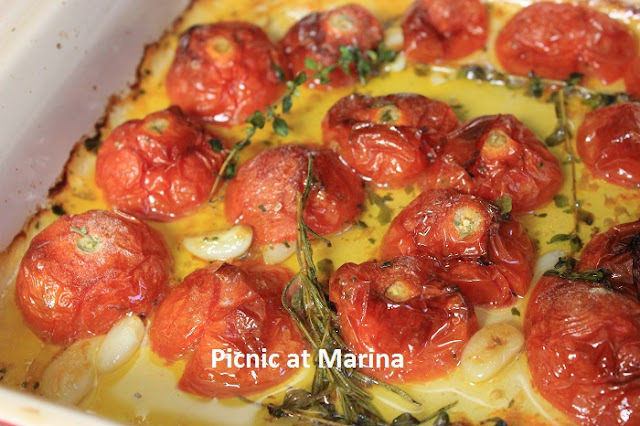 Marina, this looks fantastic, I love tomatoes. I haven't heard of these spices but they do sound tasty. Love those photos, girl, I am ready for the one on toast, LOL. These tomatoes look really addictive! I don't eat them raw but roasted well I love them! looks so juicy and tempting...lovely snaps! Thanks! Yes, flavor is amazing!